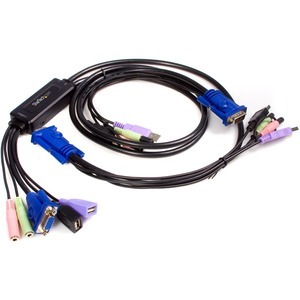 Supporting superior video quality with resolutions up to 2048x1536, this KVM on-a-cable switch is the ideal solution for accessing and controlling two desktop computers. This complete KVM solution includes all the cables and connections necessary for sharing one monitor, keyboard and mouse, as well as speakers across two computers. As an added feature this KVM provides independent audio/microphone switching, to provide an uninterrupted audio experience, even if you switch to the secondary computer. Compatible with Mac, Linux or PC based computers, the SV215MICUSBA 2 Port VGA + USB Cable KVM Switch with Audio is the perfect addition for a broad range of environments including SOHO (small or home offices), gaming, multimedia production workstations and more.